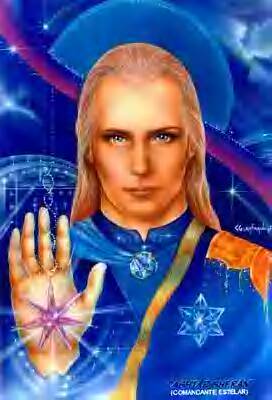 "I AM ASHTAR, SUPREME COMMANDER OF THE GALACTIC FEDERATION FLEET. WE HAVE MILLIONS OF SHIPS FROM ALL OVER THE GALAXY, AND WE ARE UNITED UNDER THE BANNER OF LOVE. WE ARE ANGELS AND MASTERS OF THE LIGHT, COMING TO YOU IN PEACE AND INDESCRIBABLE JOY! "OUR CURRENT MISSION IS TO ASSIST MOTHER GAIA, INCLUDING YOU AND ALL OF HER KINGDOMS, TO SHIFT INTO THE FIFTH DIMENSION AND THE LONG-AWAITED GOLDEN AGE. WE ARE WORKING WITH SANANDA, ST. GERMAIN, AND THE ENTIRE COMPANY OF ASCENDED MASTERS FROM YOUR PLANET. AND, MOST IMPORTANTLY, THERE ARE MANY AMONG US WHO HAVE CHOSEN TO SERVE IN HUMAN EMBODIMENT. WE HAVE PUT OUT A 'WAKE-UP' CALL TO THEM AND SINCE YOU HAVE COME TO THIS WEBSITE, YOU MAY WELL BE A MEMBER OF THE ASHTAR COMMAND! "WE HAVE ASKED SUSAN TO SERVE AS A VOICE FOR ME AND OTHERS IN OUR FAMILY, FOR WE RECOGNIZE THAT WE ARE ALL ONE IN FAMILY. THERE ARE OTHER VOICES, BUT THIS WEBSITE CONTAINS THE MESSAGES GIVEN THROUGH HER. IT ALSO HAS NEWS AND INFORMATION ABOUT ACTIVITIES BY AND FOR THE GROUP WHICH I HAVE NAMED 'ASHTAR ON THE ROAD.' WE INVITE YOU TO READ OUR MESSAGES HERE AND TO PARTICIPATE IN THIS GROUP, IF YOU ARE SO MOVED. The music playing is titled "Galactic Anthem" by Kana Benz. It was composed by Kana as inspired by Ashtar when Kana returned home from the Opening of the Portal to the Kingdom of the Elementals at Bushwillows June 20-21, 2009.